Twin needle hems are quick, easy, and accurate, though not my preferred method. It's taken a few trials over the years, but I'm finally happy with a twin needle hem on a sweater knit. I'll show you how to get good results with this method but first a note about “quick and easy”. Quick and easy is one way of accomplishing a task. It's not necessarily a good way or a bad way. Personally, I like methods that are slow and difficult. Really! I love to dive deeply into a technique, take my time, and enjoy the process. Sometimes the best way is that time-eating, challenging method and I am happy when I have the luxury of time to do it. But I also have appreciation for the quick and easy way. Sometimes it's just what's needed. What matters is that the quick way isn't also the sloppy way. This way happens to be quick, easy, and neat. Although I now spend much time teaching and enjoying cut and sew knitwear, I have many more years of hands-on experience with fully fashioned knitwear, shaping each piece as it's knitted, starting from the bottom of the sweater with a finished edge. 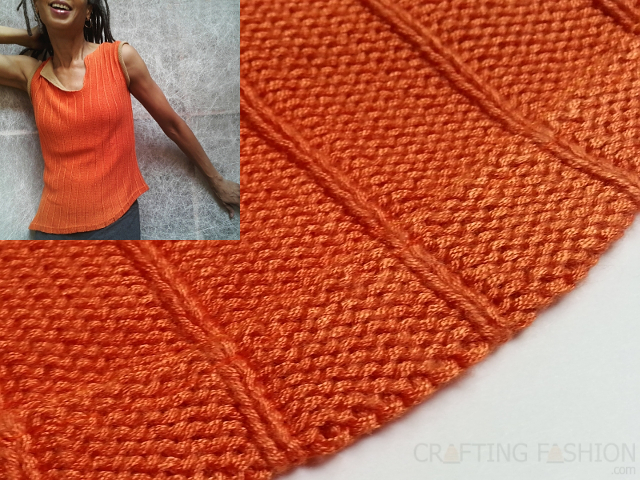 My first ever twin needle hem was on the tangerine top shown below. It was my Clementina bamboo rib sweater knit (no longer available in the shop), and had an asymmetric, curved hem no less. Due to plain old luck it came out right the first time. Subsequent twin needle hems did not. To be fair, there are different types of sweater knits and not all of them are suitable for a twin needle. I think most bulky knits, for example, look bottom heavy with this finish. My Saint Cloud fabric, in the Instagram Stories compilation below, is what I consider a medium-weight sweater knit. It's 100% wool and can survive the heat of an iron. Because it's also somewhat fuzzy, cut edges do not fray easily or have a ragged look. The fabric worked well with a twin needle finish. Ultimately, each sewist must evaluate the particular fabric's properties and make the decision about whether the finish looks finished enough. Coverstitch machines are more appropriate for thinner knits. I don't sew with one myself and don't have a lot of advice. Just as with the twin needle finish, I don't always like the look of a coverstitch on heavier knits. 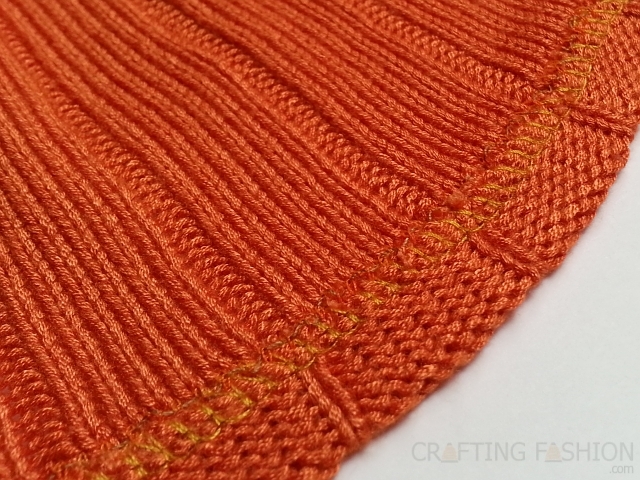 Regardless, know that the preparation for using a twin needle will also work for a coverstitch. Sewable fusible web tape (slightly narrower than the hem width – I used 7/8” for a 1” hem). Please note the product I use is sold as "fusible web" not "fusible interfacing". The video below is a compilation of Instagram Stories I posted last Saturday #OnSaturdaysWeSewSweaters. Step by step written instructions are below the video. Work with pre-washed fabric (as always)! Step 1. Mark or pin the hem in your usual manner. 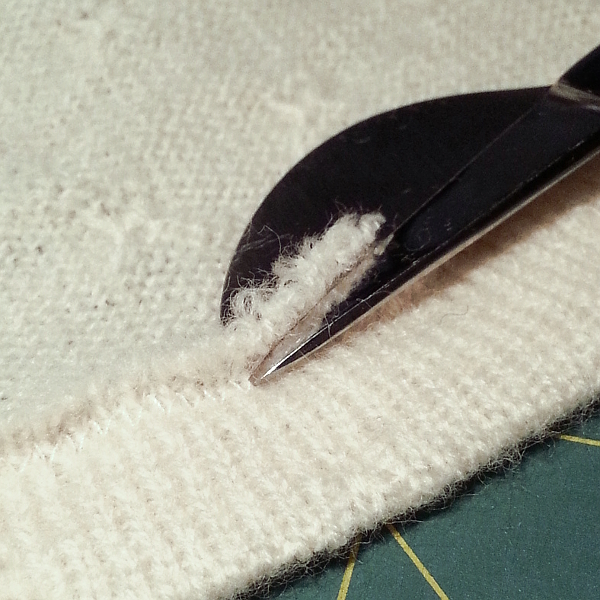 Then mark the fold line on the wrong side of the sweater with your marker and remove any pins. Step 2b (using web with backing). If the fusible web has a backing (such as Clover fusible web, Heat 'n Bond Lite) then you need to use a 2-step process. First, line up the bottom edge of the web along the marked fold line with paper backing side up. With your iron press on top of the paper backing to fuse it to the fabric, following manufacturer's instructions regarding iron settings and time. Peel off backing when cool. Fold up hem using the bottom edge of web as a guide and press, again following manufacturer's instructions. In either case, “pressing” means placing the iron on the fabric for the indicated amount of time, lift the iron straight up, and repeating on the next section of hem. Do not slide the iron back and forth! Fusible web provides temporary stability. When cool the hem will be slightly stiff, which is exactly what you need when sewing with a twin needle. Step 3. Make sure you're using a twin ball point needle that's correctly sized for your sweater knit. Size 80 needles spaced 4.0 mm apart work well with this particular fabric. Sewing machine tension should be a little looser than normal. If your machine has a special twin needle setting, be sure to use it. Once the fabric is cool, sew through the top edge of the web with a twin needle, public side up. You'll be able to see the edge of the hem through the fabric, so it'll be easy to keep things aligned. Step 4. When finished sewing, if the hem is slightly stiff or seems too stable, give it a gentle stretch. The natural springiness of the fabric will return. Any remaining stiffness will disappear once the garment is washed. If necessary, trim on the inside with regular or duck billed scissors. * That “no iron, no press” rule I mentioned? Steam your sweater knits by holding the iron half an inch to 2 inches above the fabric and allowing the steam to penetrate the fabric. Let the fabric dry before moving on to the next section. Do not iron. That is, don't allow the iron to rest on a sweater knit fabric. Do not push the iron back and forth on the fabric. Do not press. Do not allow the iron to rest on the sweater knit. Sometimes you will need to press when using fusibles (as in the tutorial above) but never ever press acrylic sweater knits or other sweater knits that are primarily synthetic. You might permanently press the springiness right out of the fabric a.k.a. “killing the knit”. At worse, the fabric will melt. Mark hem. Turn hem and fuse with fusible web (important part)! Sew with twin needle when cool. Give a little stretch when done. That was quick and easy, wasn't it! Join the list for more sweater knit tips, techniques, and discounts on O! Jolly! sweater knits.